Is this the only keyword tool you will ever need? My Jaaxy Keyword Tool in Review blog will give you all the ins and outs of this online software which will be an absolute game-changer for your site and sales. I touched on the use of Jaaxy in my How To Guide for Keyword Research which of course you will want to check out for great tips on how to use keywords. Jaaxy can be used on PC or Mac because you do not need to download software, it is an online based software. The program offers speed and data accuracy you can rely on, as well as being one of the easiest keyword tools I have used. You want high traffic keywords with low competition and Jaaxy will help you find them. 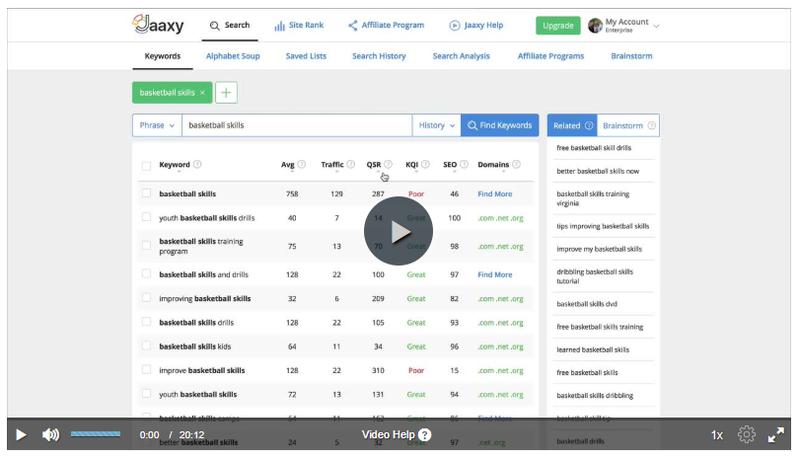 By combining Google data with its own proprietary data Jaaxy delivers outstanding keyword results in seconds that could take you hours of research through multiple programs. And offers you hundreds of options not just three or four like many other programs. OK that’s just the start if you are after a more in-depth review before you consider parting with your money then read on. Jaaxy can be used by every level of online entrepreneur from rank beginner to seasoned professionals. The program is super easy to use and the keyword results are easy to interpret for those of us new to undertaking keyword research. As a newbie you don’t need to be overwhelmed with too much information but if you ever hope to run with the big dogs you need to be using the very best keywords possible in your content right now. That’s high traffic, low competition keywords. There are plenty of them you just need to be able to find them. Jaaxy gives you this information in an easy to understand format. The screenshot below shows you exactly what you get from a keyword search. As part of your keyword search results you are also offered alternatives. Perhaps like me you have an idea for an article but you just can’t think of a great title or the title you want has terrible search results but you can’t think how to reword it. No worries Jaaxy does it for you. This image is showing the first 5 alternate options which were suggested for my original keyword search. There were a further 15 possible combinations offered as well. You can also save your keywords so if you come across some great search results but your not quite ready to write that content, you can simply save them for use later. This way you don’t need to remember those fantastic keywords you find they are all there waiting for you. I find I often get on a role once I start doing research and can come up with easily 30 – 40 keywords which I save to my list for later articles. To be brutally honest the program is so simple you don’t need additional training to use it. If you do need a step by step training program to start you on the right road to a successful affiliate marketing business you can’t go past my #1 recommendation – Wealthy Affiliate (and you can read why by clicking here). You do get additional training on choosing and using keywords so that you are making the most of search engine optimisation (SEO) for your website and not leaving money on the table when it comes to building your online business. This includes positioning yourself perfectly within the search engines and not just writing killer copy that no-one will see. Various levels and price for Jaaxy? It’s probably easiest to provide you with the image from the Jaaxy web page rather than try to cover all the aspect in each level. Click on the image for a larger clearer version. As with all the products produced by Carson and Kyle of Wealthy Affiliate fame, there are no sneaky upsells or hidden costs. They are very upfront about what you get from each level of the Jaaxy program. As you can see you can try the program for free as a Starter. This will give you 30 free searches and an opportunity to test out all the other features available. If you are an existing Wealthy Affiliate Premium member the costs for each level goes down dramatically. The Pro version will cost you only $19/month and the Enterprise version only $49/month as a WA Premium member. Both Pro and Enterprise you get unlimited searches, faster searches, increase results for the alphabet soup technique and site ranking. Realistically if you are a bit further down the track with your website and you need to streamline your operation Enterprise offers the best bang for your buck. For us newbies Pro works really well, it just means you need to manually click each keyword for the results instead of it happening automatically. Can I check my website rank? This is information as a budding entrepreneur you need to know and be able to get your hands on quickly. You need to be able to determine which of your pages or posts are ranking is essential to know what you are doing right and should therefore replicate. Jaaxy has you covered for this as well. In a few short seconds Jaaxy searches Google, Bing and Yahoo for your related keyword and content. The top 3 search engines all in one search, pretty cool hey! On the Starter membership Jaaxy only searches the first page of the search engines. Pro and Enterprise will search the first 20 pages for your results so that does give you a more extensive result. So you can see for one of the earlier pages on the Rat Race Escape Project we are ranked at #3 on Yahoo but not getting a showing on Google or Bing at this point in time. Patience is key in this business! For the more visual amongst us, I have included a fantastic video from Wealthy Affiliate founder, Kyle with some of the basic training on how to use Jaaxy. This gives you a great overview of the platform and its huge amount of features. I love being able to offer you guys opportunities to try these program without having to pay a cent and Jaaxy is no exception. You can try out all the features at your leisure, with 30 free searches and there is no time frame for those 30 searches so you can use it for as long as you like. Simply put in a keyword you want to search for in the box below and you can get started using your free searches. I love Jaaxy for anyone in the blogging or affiliate marketing space. You are simply wasting your time writing blogs, pages or posts without viable keywords, and you need an easy to use but accurate tool to find those elusive keywords. With all the other add-on features in the one program, you’d be mad not to give Jaaxy a try. Recommended: Wouldn’t be without it! As always if you have any questions about Jaaxy or this Jaaxy Keyword Tool in Review blog please pop them in the comments box below. If you have another keyword tool you use and recommend let us all know too so the community can check it out. I like your site. I feel you in your words and can relate. It is very informative and answers a lot of questions for people like me who want to make it in the world of online businesses. I like what I read so much that I put your site in my must come back to column on my laptop. You have a nice and clean site. Reading your information has energized me to do more on my site to make it bigger and better. Great job and keep up the good work. So glad we could energize you. Our aim here at the Rat Race Escape Project is to help create online super stars and with your enthusiasm I can see you will be one of them. I wish you every success with your site and of course we’d love to see you back here any time for more information and motivation.